Picture a high school math teacher that casts doubt on the textbook he’s teaching from. How adept at mathematics do you think his students will be? Or imagine a quarterback that doesn’t have confidence in his coach’s playbook. How far can the team progress into the season? These scenarios illustrate the reality of much of the theological education on the mission field today. Liberal Christianity and skepticism regarding the truthfulness of the Bible have been exported from the shores of America, and flown throughout the globe into the remotest regions on the planet. The consequences of the aspersion cast upon the text of Scripture have been devastating to the mission field. Many well-intentioned church leaders taught by Western missionaries mimic the unbelief of their teachers and doubt the veracity of Scripture. As a result, they base their ministries on pragmatic strategies and human experience—everything but the Word of God. And why wouldn’t they, if Scripture is nothing more than just another voice in the conversation? As you can imagine, the spiritual health and vitality of these churches suffer for lack of being fed from the mouth of God (Matt 4:4 ). In fields where there was once an unwavering loyalty to God and His Word, missionaries—not pagans or atheists—are sowing the seeds of doubt and unbelief, rather than the seed of the Word of God which brings a true spiritual harvest. The Master’s Academy International (TMAI) believes that as missionaries go into the field to bring new converts to a saving knowledge of Christ, it is of utmost importance that they instill in their young “Timothys” a lofty view of Scripture—reverence for God and His Word. It is TMAI’s conviction that if missionaries do not believe in the inerrancy of the Bible, they have no business being involved in disciple-making through theological education. In response to the diminished view of Scripture espoused by many theological institutions around the globe, TMAI is planning to host an international symposium aimed at shining a spotlight on the topic of inerrancy and its implications on the global church. The international symposium, held in conjunction with The Shepherds’ Conference Summit on Inerrancy (hosted byThe Master’s Seminary) in March 2015, will feature leading voices from around the world who share TMAI’s commitment to a high view of Scripture. These speakers, including Paul Washer, and James White, will clearly and compellingly demonstrate how the affirmation of biblical inerrancy is critical to a biblical approach to missions. 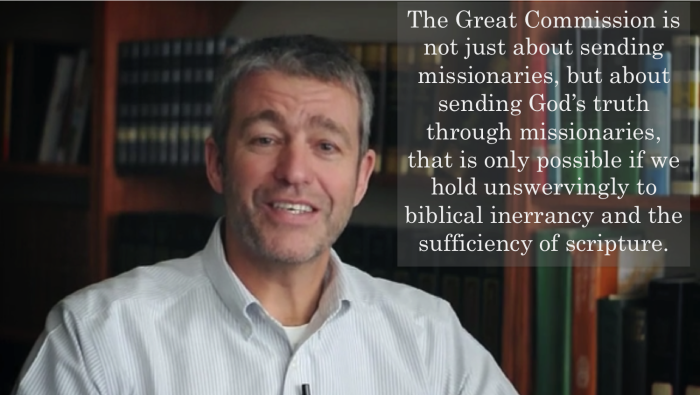 Paul Washer: The Great Commission & Biblical Inerrancy from TMAI on Vimeo. TMAI is proud to host evangelical denominational leaders, theological educators, and national pastors from over 50 nations who will come together to carefully consider the direct impact of inerrancy on their ministries. You won’t want to miss this opportunity to hear speakers from around the world address the topic of inerrancy from various international perspectives. If you are a pastor, elder, missions committee member, or a layperson with a heart for missions, we invite you to join us for this historic event. The Master’s Academy International (www.tmai.org) is a missions agency connected to the pulpit ministry of Dr. John MacArthur and to The Master’s Seminary. TMAI’s mission is to strengthen the evangelical church around the world by equipping qualified leaders to start and strengthen local churches. Comprising 18 training centers and seminaries around the world, with over 2,800 current students and 3,800 graduates, these schools all share a common doctrinal statement and a common goal: to help the indigenous church train her own pastors and leaders in biblical integrity. With an emphasis on expository preaching, these nationals are trained to biblically shepherd Christ’s church and entrust this ministry to the next generation of faithful men (2 Timothy 2:2 ). The result is a strengthened indigenous church that is able to reach the community far better than missionaries could.